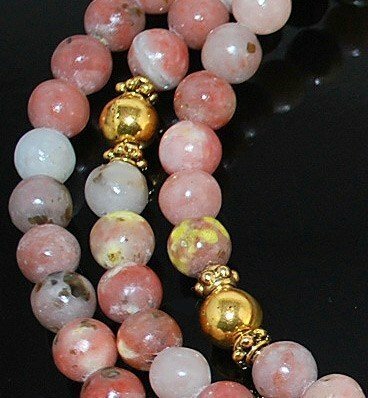 The Bliss Mala, made of 8mm lepidolite beads, with golden brass markers, and finished with a rose quartz guru bead, snakeknot, and rose quartz adornments. Bought these for a friend who’s been super stressed. Beautiful! Love it, wear/use it everyday, beautifully crafted. 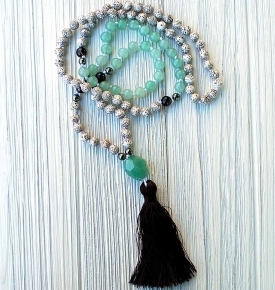 I love this mala. It is beautiful and very comfortable to wear. It is loose and moveable on the thread so it doesn’t pinch at the neck. Its’ light colour is very natural and soft, blending on the skin nicely and matching with any clothes, as I wear it often. I really love it. 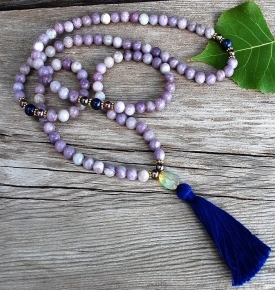 I absolutely love this special mala. I get so many people asking me what is the name of the stone. I get great energy from the mala. Blends with my outfits. Made very well. I was surprised by the rough texture of the beads at first but I’ve found that the off texture helps me to stay mindful and in the present Because the beads are less smooth than usual. I also love the colors they transfer from bead to bead as a wave of color. It reminds me of rocks at the bottom of a stream or river. 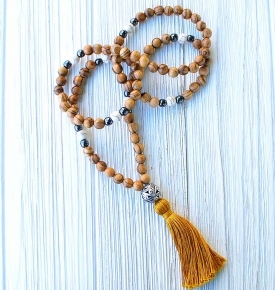 This mala is exactly what I was looking for. I don’t want to leave the house without it! The texture of the beads is smooth, but not glossy. The colors are beautiful. Would definitely recommend to someone looking to strengthen their heart chakra. This mala was absolutely beautiful! 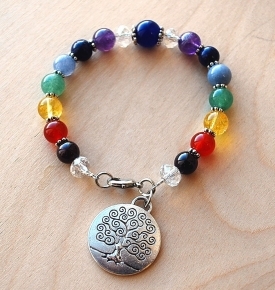 The mala was well-made; the beads were smooth but not shiny and a lovely shade. I would recommend the work from Sakura to anyone. I have other malas but this one I’ve been using regularly. 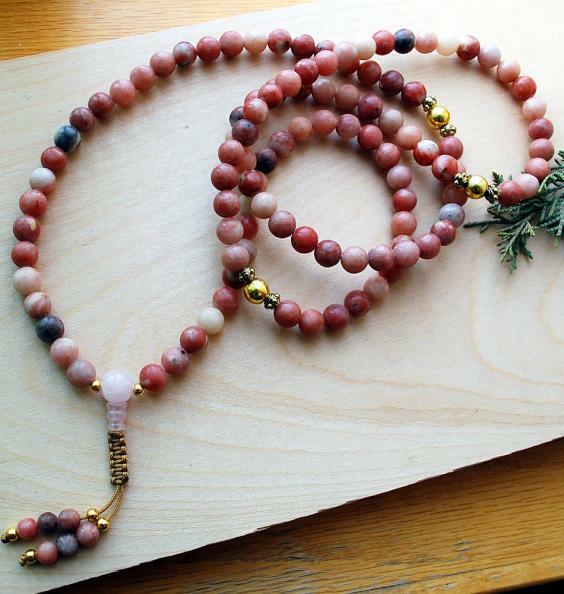 The weight of the mala is perfect as it keeps me focused as I do my chanting. This one is also so incredibly beautiful so I really enjoy looking at it as I use it. 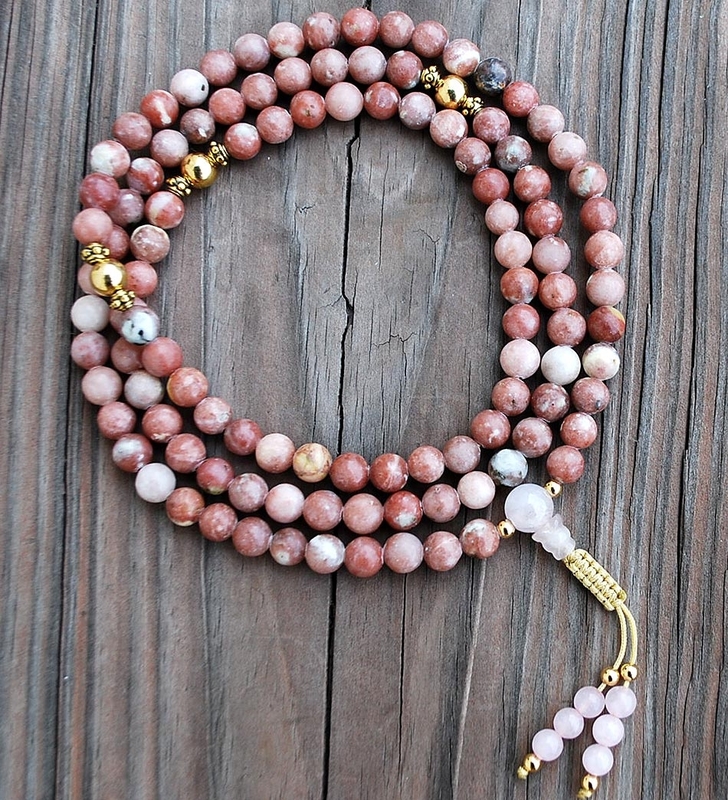 Also I wasn’t expecting the gorgeous pouch that came with it (pink and gold) just perfect for this mala necklace. I don’t anticipate wearing it like jewelry. I treat it like I would my other crystal necklaces too. 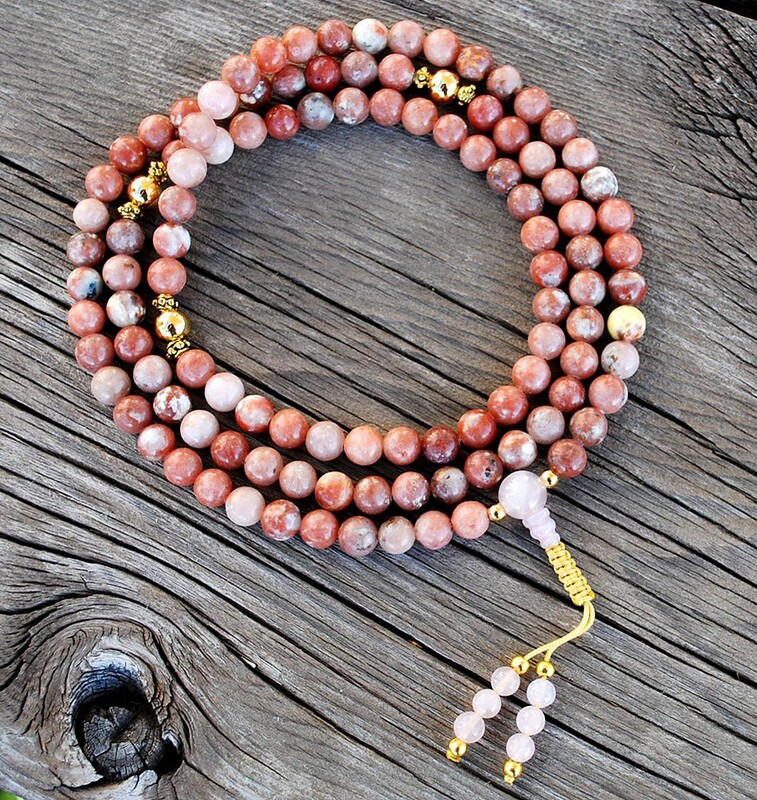 Thank you for creating such a beautiful mala!